All the plays that I have written come from a place inside me that I find it difficult to express in any other way. They all reflect the era in which I was living when I wrote them, or alternatively the era just prior. Theatre allows me to talk about what I feel or what happens to me from a safe distance and it helps me to understand what has happened. All stories have underlying their surface the true story that they are talking about. And it is this hidden story that, like a soundtrack, accompanies spectators and, from time to time, floats to the surface and sparks their emotions. The story on top must be entertaining, maintain a pace, be exciting and never stop progressing. The underlying story is like a tide. For me writing is thinking about the story on top, and always keeping in mind the story underneath. See below all the activities involving Clàudia Cedó in the frame of Fabulamundi. Psychologist, stage director and playwright. She holds a degree in Psychology from the Universitat Autònoma de Barcelona in 2005, is a graduate in Dramatic Art and trained in theatre of the oppressed. She worked as a psychologist at prison centres for three years and in 2006 created Escenaris Especials, a project that does theatre with people at risk of social exclusion. She teaches the course Theatre as a Tool for Inclusion at the COPC, at the UAB, at the CaixaForum and at the Confederación Autismo España. She co-organises the Theatre and Psychology Sessions in Girona. As an actress, she has participated in shows such as Nada nuevo que contar, Pervertimiento and Tänzerin hinter Stacheldraht at the Dokumentartheater in Berlin – winner at the F.I.T. in Minsk and at the Festival de Monaco. As dramaturg and director she has worked on shows such as Vida a Mida and Júlia? (winners of the C. Manlleu Prize), De petits tots matàvem formigues (winner of the Buero Theatre Prize), El Pou (starring one hundred actors at risk of social exclusion and winner of the Compromís Girona Prize) and Et Planto. 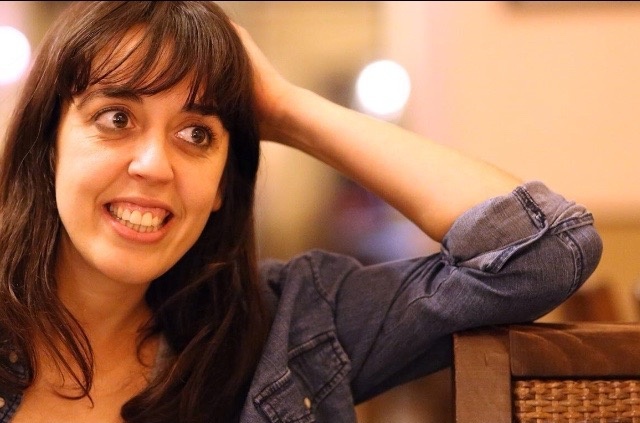 In 2015 she premiered Tortugues: La desacceleració de les partícules at the Sala FlyHard, with which she won the Butaca Prize for Best Text and was nominated for the Butaca Prize for the Best Small-Format Show and for the Playwriting and Revelation section of the La Crítica Prizes 2015. That same year, Clàudia Cedó won the 5th Catalan Playwriting Tournament at the Temporada Alta Festival. In 2016, she premiered L’home sense veu at the Sala FlyHard. Clàudia Cedó is resident author at the Sala Beckett for the 2017-2018 season. Júlia has decided that she’s had enough. She’s leaving. The plants are flooding the apartment and she is drowning among their leaves. Miquel is static, bored, occupied with classifying bonsais, incapable of understanding the girl’s free and chameleonic spirit. The break-up will submerge both of them into a labyrinthine universe of commonplaces and déjà vus. The desperate attempts of Miquel to make Júlia return will blur his personality, making him something that he is not and making him head up a hilarious persecution in the midst of a mosaic about own identity. Et Planto is a game of Russian dolls, a glaring comedy, a story of love in a spiral that aims to survive by transplanting its protagonists as many times as necessary. Play for 3 actors and 1 actress. For some time, Joan and Marta have realised that they are not moving at the same pace. They love each other, but they tread on each other when they dance and Joan’s neurosis is about to break up the relationship. Pushed by the desire to synchronise and have a calmer pace of life, they move to the countryside to take things more slowly. But when their lives cross with those of Òscar and Àgata, a couple of young scientists who live life at full speed, the simple lifestyle they were seeking will end up getting complicated. Play for 2 actors and 2 actresses.